What if one person had the ability to change the power balance of the world? Since its debut in late 2006, Code Geass is a series many have either seen or heard of over the years. In a rare move, Sunrise deviated from its long-established franchises like Mobile Suit Gundam and created an original work that took Japan by surprise. 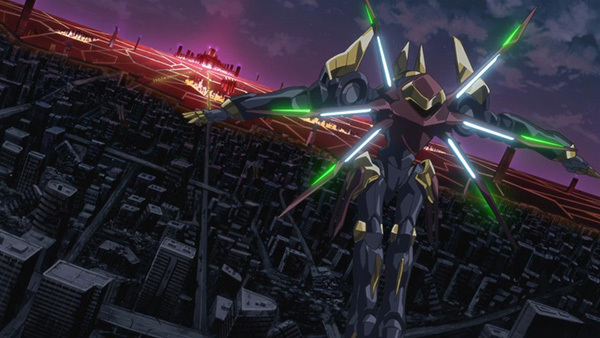 Code Geass mixes politics, mecha and a very personal hunt for vengeance to form something that has been talked about for years and what many consider to be a modern classic. Given the spoiler-centric nature of this plot-twist-ridden show, I’ll try not to reveal too much about the plot itself. Without further adieu, let’s dive into the first half of this series. Code Geass is set in a fictional world where the Holy Empire of Britannia is the dominant, global power with a policy of absolute conquest. 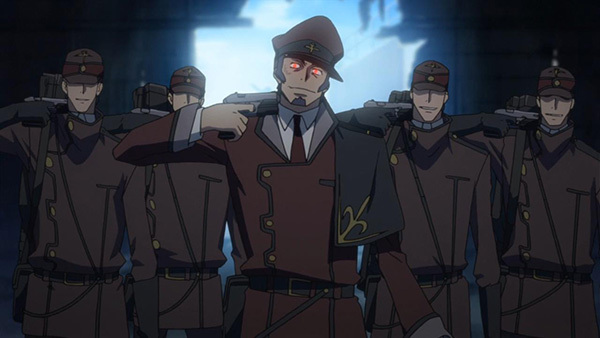 In the year 2010 Britannia launches a blitzkrieg on the technologically inferior nation of Japan, annexing it under the name of Area 11, driving the “Elevens” into poverty and settling its aristocracy in privileged positions. Resistance exists in isolated pockets but it is hardly united enough to pose a threat to the occupying forces. 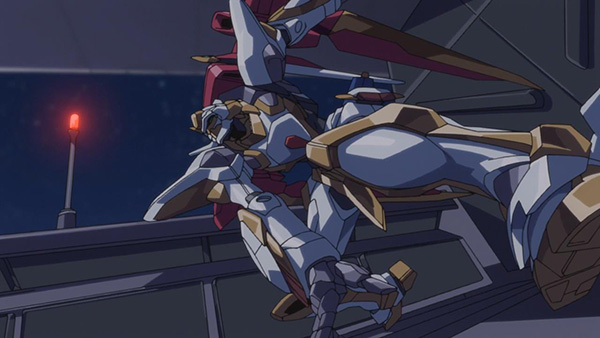 The Britannians have developed mechanised robots called Knightmare Frames and it’s always great to see a mecha anime that progresses the show’s technology, as newer units are pumped out by both sides to cope with the ongoing conflict. 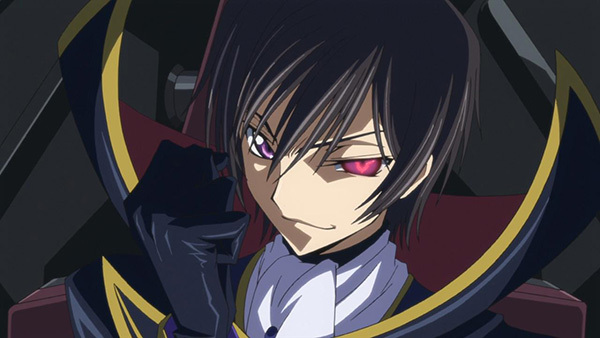 Lelouch Lamperouge is an exiled Britannian prince posing as a student in Area 11. He lost his father’s favour as a child following the assassination of his mother, blaming his father for leaving her defenceless and caring little for her death afterward. Lelouch effectively relinquishes his connection to the throne. During the invasion he was banished to Japan to serve as a political hostage, befriending Suzaku Kururugi who was the son of the last Japanese Prime Minister. 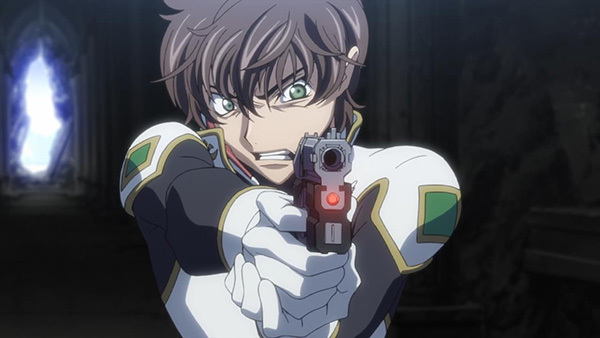 Events lead to Lelouch encountering a mysterious girl who grants him the power of Geass – an ability allowing him to force anyone to do as he commands as long as he initiates eye contact. Naturally, this allows him to carry out his rebellious plans against Britannia using the alias of “Zero” with the help of the Japanese resistance. Lelouch is portrayed as an anti-hero, as he often uses these forces only to further his own goals for revenge. His leadership qualities and strategic brilliance leave the Elevens no choice but to follow him. In a twist of fate Suzaku is called to fight as a Knight of Britannia, pitting him against Lelouch (disguised as Zero) unknowingly. What follows are masterful battle tactics and sneaky diplomacy interspersed with dynamic character interaction. This intense and well-crafted game of cat and mouse dominates the first season of Code Geass and culminates in a jaw-dropping conclusion before season two. The plot and pace here is arguably one of the benchmarks of the anime medium and should be experienced by everyone to judge for themselves. Code Geass first aired in 2006 and it’s aged very well. The animation is smooth, bright and depicts the robot Knightmare Frame battles spectacularly. The character art is instantly recognisable and very much defines Code Geass. 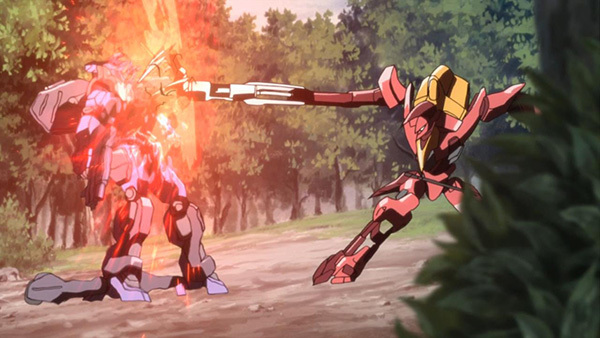 A very cool technique was the CG used to animate the “Geass” effect, something anyone watching Sunrise’s laetst anime, Valvrave the Liberator, will notice as familiar. My only complaint is sometimes the art looks too clean with very few shadows and lines, but again, that seems like the style of the anime itself. It’s by no means gritty and realistic, but there’s suitable amounts of blood when things get violent. Given the monarchy of Britannia, everything is very elegant and aristocratic with the appearance of their forces. It’s really cool seeing a pilot in fancy attire piloting an equally elegant killing machine. Personally I found the audio even stronger than the visuals department with surprisingly stellar voice acting performances across the board, both English and Japanese. The music is fittingly epic, with chaotic situations accompanied by a frantic orchestral score that will always bring you to attention. Happier school day antics have lighter music and the mysterious vocal tracks will stick with you longer after you finish Code Geass. I’ve been holding out to hear the same composer’s work elsewhere but unfortunately I’ve only heard it here. It really is that good. It’s a shame that only 2.0 sound is included for both language tracks here, as this is an anime that would benefit greatly from 5.1 channel support. 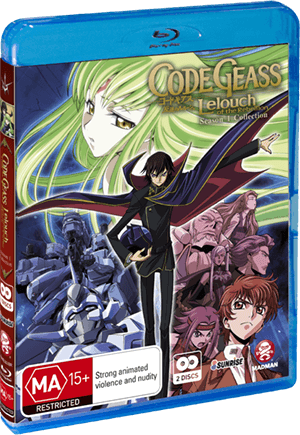 Code Geass is packed in a standard Blu-ray box with only reversible artwork as an external feature. It appears this is a Manga UK release re-badged by Madman, so any fancy packaging seemed off the cards regardless. On the discs though there is insightful audio commentary by the staff and some unique picture dramas, which I don’t see too often in anime releases. There is a reason Code Geass remains on many people’s lists of must-watch anime. Robots and geopolitics might not be your thing, but chances are you’ll find yourself on the edge of your seat regardless. It’s simply an awesome blend of action and intrigue with a plot that goes further than you could ever expect. Season One sets the stage for a grand showdown after escalating to a fever-pitch, with no clues as to where it’s heading next. If you haven’t seen this yet, do yourself a favour and watch the first season. Then find yourself breathlessly keen for its second half.